Note to Buyers: The reduced size headgear does not come packaged with any of the mask so if you are replacing a headgear that came with a mask it is the standard size. 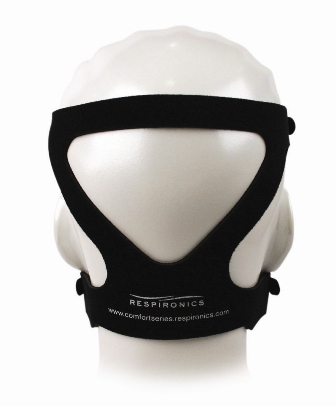 This is the Respironics Premium CPAP Mask Headgear with EZ Peel Tabs. 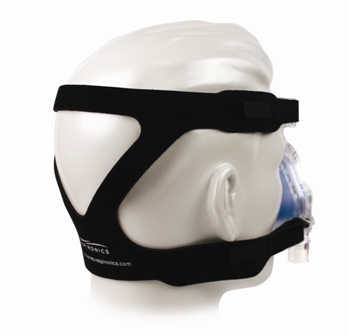 This headgear will fit all Comfort-Series nasal and full face cpap masks made by Respironics. It will also fit many other nasal CPAP masks that have four attachment points. Does not include swivel clips. The Premium Headgear with EZ Peel Tabs has a simpler overall design that gives patients a new level of comfort, along with easy-to-use features and increased durability. In other words, its a total improvement over any other headgear Respironics' previously offered. The measurements are a precise match to the ResMed 16117 headgear, which is used on ResMed Ultra Mirage II, Mirage Micro, Mirage Activa, Mirage Activa LT, Mirage SoftGel, Ultra Mirage FFM, and Mirage Quattro FFM. This Premium Headgear can be substituted for the 16117, and is of superior quality and durability, at one half the cost. Soft Lycra - Soft Lycra stretch fibers are used to weave thicker, wider straps. They feel more comfortable against the skin and wont dig into the neck the way thin straps do. And, wide straps help to keep the mask more stable during use. EZ Peel Tabs - EZ Peel Tabs at the end of the straps are easy to locate and easy to adjust to help find the perfect fit. Yet, these easy-to-release tabs will hold strong night after night. This headgear is tough and durable enough to stand up to repeated washing, while keeping the softness you appreciate. The headgear purchased is just as advertised and fits perfectly, was the lowest price with free shipping I found online and I am very happy with it. It arrived in a timely manner and was packed appropriately for the item. I will look for all my CPAP needs at bestcpapprice.com in future. Item received did not have "easy peel tabs", Photograph on web catalog shows tabs on Velcro ends of straps which were not on headgear received. Other wise headgear is acceptable and can be considered an upgrade to standard headgear. Headgear would be improved by addition of extra material in the form of "easy peel tabs". Everything is fine but the strap. There is no give to it. Every one I have had previously was elastic. BestCPAPprice.com has came through once again. Very quick shipping. The head gear I ordered was exactly what I needed and I would recommend BestCPAPprice.com for medical equipment purchases. I expected this headgear came with an elastic adjustment like the one I purchased in 2014 - Philips respironics. It is not as soft & comfy, need to replace. The item shipped and arrived quickly (good). It seems adequate but not the same quality as the original, which is what I thought I was buying (bad). It is very thin in comparison and has no "stretch" making it harder to adjust for a snug fit without it being uncomfortable. I would probably not recommend this particular unit. *** BestCPAPprice response - this is the exact same headgear that we have been selling for years, and it is the genuine OEM Respironics replacement headgear for the ComfortGel masks. It should be the exact same product that is sold with the masks. We will be happy to replace it if you want to send it back. Been using this style for years and it works great. Perfect headgear for mask. Great people to do business with. I am extremely satisfied with the CPAP Mask Headgear, and will continue to get all my CPAP supplies here. Very comfortable to wear, much more so than the standard headgear that comes with the Comfort Classic mask. I wish the velcro tabs were a little stronger but overall a very good fit. OK, but the unit separates, and doesn't last long. This did not happen when I first started using the headgear about ten years ago. 3 Respironics headgear. Came very quickly at a very reasonable price. You are my new and only on-line store! The new Mask Headgear fits perfectly and is well made. Their have been no issues.. I used the original strap that came with my APAP machine in October 2005. This new strap fits a lot better and is much more comfortable. I knew I needed a new headgear but when I received this one I realized how horrible my old one was! This is the best money I've spent in years! Thank you for a great product! Q: Respironics Premium CPAP Mask Headgear with EZ Peel Tabs - will this fit a ResMed Mirage Quattro? A: Yes, this is about the same as the blue headgear that comes with the Mirage Quattro.